20th Century Fox finally stopped making us all wait and wonder as they released the first trailer for War for the Planet of the Apes over the weekend. In a week packed with great, big trailers the first full-length trailer for the third installment of the rebooted Plant of the Apes franchise really managed to stand out. If that wasn't enough for you, a new international trailer for the movie has also surfaced online, showcasing a bit more of really tense footage from the movie. The new War for the Plante of the Apes trailer just made its way onto YouTube and is much shorter than the first trailer and also uses a lot of the same footage. However, the intro scene for this international trailer sets up the tension between Woody Harrelson's new character and Andy Serkis' Caesar very nicely, with some more dialogue and some serious tension. Much of the footage from this intro scene was shown in the original trailer as well, but cut this way with the new dialogue it really gives a better sense of what is actually going on and just how ugly things are going to get between these two. In case you missed hit, here is the official synopsis for the movie. It seems unlikely that this will be the last installment of this new Planet of the Apes franchise (assuming it does well), but it does seem like it could be the last time we see Caesar. There are moments in both trailers that make his fate seem potentially grim. That is not to say they couldn't continue on, because as Woody Harrelson teases in the trailer; if the humans lose, it is going to be a "planet of apes." Assuming the fourth movie takes another leap forward in time, we could wind up essentially at or near the events of the original Planet of the Apes. As has been the case with the previous two installments of the franchise, a totally new set of human cast members has been shuffled in for War for the Planet of the Apes. Judy Greer, Steve Zahn and the previously mentioned Woody Harrelson have all joined the cast of the movie, but some very important cast members are returning. Max Lloyd-Jones is returning as the ape Blue Eyes, Terry Notary is back as Rocket but most importantly, Andy Serkis has come back to reprise his now very iconic role as Caesar the ape. Motion capture or not, the performances by them have really helped carry the franchise this far and by the looks of things we are in for some more excellent performances. 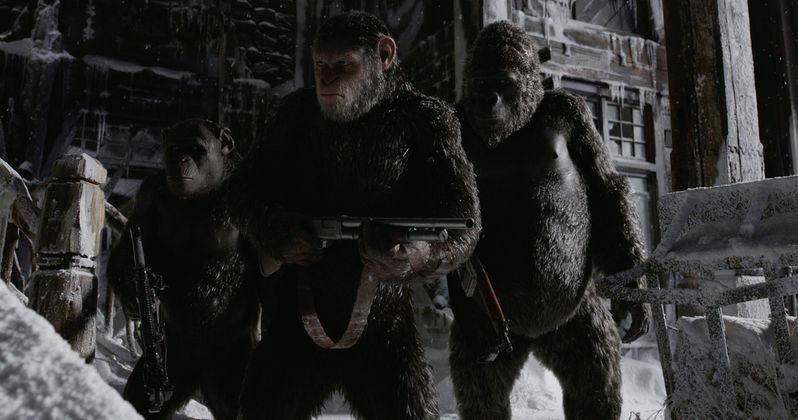 War for the Planet of the Apes is written by Mark Bomback and Matt Reeves, who is returning to direct this installment after helming Dawn of the Planet of the Apes. The movie is set for a prime-time summer release on July 14, 2017. Be sure to check out the new international trailer for War for the Planet of the Apes for yourself below.